This annual report provides an account of our activities in 2015 and clarifies our role in the energy transition. Transparency and an open dialogue with stakeholders are key priorities in our reporting process. Our annual report is largely structured according to three stakeholder groups: customers, employees and shareholders and investors. This approach corresponds with Alliander's governance model, which is geared to these three key stakeholder groups, with a strong focus on the customer. Our continuous dialogue with these and our other stakeholders gives us greater insight into trends and needs in society. It also enables us to exchange thoughts and ideas, and to test our proposed policy choices and decisions among stakeholders. You can read more about our stakeholder materiality test in the Other information chapter. We asked our stakeholders what aspects they thought we should report on. Drawing on their input, we selected a list of 15 themes that form the basis of the annual report. The illustration below depicts the top 15 themes that matter most to our stakeholders. The energy transition comprises a shift away from fossil energy generation towards local renewable energy sources, thereby promoting the transition to a more sustainable society. Customers expect flexible and reliable networks, so they can feed in energy whenever they want. Developments in technology and economic trends make new solutions both feasible and necessary. Alliander wants to do its share by facilitating the energy transition. The energy transition demands new and smart applications for the energy networks. Alliander is investing in smart technology to facilitate the transition to a sustainable society, while continuing to guarantee reliability of supply. In 2015, there was a sharp increase in the amount of solar energy customers fed into our network. We also helped customers start up local sustainable energy initiatives as well as initiating innovative business activities in order to cultivate new markets. Ensuring a continuous supply of energy is vital to society. Interruptions have a direct impact on the interests of our stakeholders. And customers want immediate information about interruptions and an indication of the estimated outage time. We aim for a consistently low electricity outage duration of at most 22 minutes per year. We work every day to secure a continuous energy supply, both now and in preparation for the future. We have invested EUR 700 million in the quality of our networks to increase their reliability. Our outage duration amounted to 21.9 minutes in 2015. Alliander is actively responding to the changing energy landscape and the transition to the energy system of the future, which includes rolling out new technologies and solutions. After all, customers expect us to help them make new energy choices. We want to gain experience with a view to realising the energy system of the future, offering the smartest possible solutions for our stakeholders. We do this by exploring new markets and encouraging market parties to pursue and implement sustainable innovations. In 2015, we set up pilots in various places such as Heerhugowaard, Texel and Lochem in order to experiment and gain experience with smart energy solutions together with customers. We also initiated new business activities in the field of electric mobility and helping customers make responsible energy choices. Safe working practices are vital to all stakeholders. Employees expect a work environment where they can concentrate and work safely. And customers expect us to guarantee their safety when we carry out our work. Everyone safely home! That is Alliander’s safety ambition. The objective is an LTIF (lost time injury frequency) of 2.2 or lower. In addition, Alliander wants to realise a score of at least 3 on the safety culture measurement. This culture can be described as: “Alliander wants to determine which safety rules are considered important, listen and learn from its stakeholders, and take responsibility. The responsibility for safety and regulatory compliance mainly rests with the senior management. Safety is a top-of-mind concern and that is appreciated”. We undertake safety initiatives and have developed a safety programme aimed at realising intrinsically safe working practices. In 2015, we engaged in a safety dialogue with employees, introduced improvements in the workplace and trained managers and employees to recognise and report risky situations more quickly. A new safety approach was further rolled out in 2015. The LTIF amounted to 2.1 and our safety ladder score is 3.1. Through the ongoing digitisation of our infrastructure, we enable sustainable generation at decentralised level. We also invest in the greening of our CO2-footprint. We participate in pilots and partnerships in order to learn from developments, such as the sustainable energy project ‘Energiekoplopers’ in Heerhugowaard. In addition, our new business activities are furthering the development of the energy system of the future. We support customers in making responsible choices, invest in alternative infrastructures and are digitising our networks. In 2015, we greened part of our operations for the first time with renewable energy generated in the Netherlands. Grid operators charge costs to their customers. The tariffs are regulated and determined by our regulator, the Authority for Consumers & Markets (ACM). Customers want to have control over their energy costs, as well as predictable grid management tariffs. We aim to continuously outperform the sector in terms of costs and operational excellence. In addition, Alliander wants to realise solid financial results. In 2015, we devoted attention to cost control measures, adhered to a careful investment schedule and expenditure pattern, and closely monitored our position in the national benchmark of grid operators. Meanwhile, we also worked on our strategy to keep the social costs for energy as low as possible, now and in future. The 2015 grid management tariffs at Liander for our customers were comparable to the previous year. In fact, the tariffs would have been lower if they had not been taxed with sharply higher regional sufferance tax levies. Climate change is a global problem. Stakeholders expect an active climate policy aimed at lower emissions throughout the energy chain. We aim to reduce our CO2emissions. Alliander engages in various activities to reduce its CO2 emissions, including the greening of our energy usage through the procurement of Guarantees of Origin for renewable energy generated in the Netherlands. We are working within the Dutch grid operator community to create a uniform standard for calculating our footprint. In 2015, our CO2emissions were 30 ktonnes lower than in the year before. The energy infrastructure must be capable of reliably absorbing fluctuations in supply and demand for energy. Customers expect a network that enables them to feed in energy both easily and instantly. They also expect us to make the network more reliable and transparent with the aid of innovative technology. Alliander’s objective is to complete 90% of its most important digitisation programmes within Alliander. The aim of these programmes is to construct intelligent networks and offer smart meters. We are working at various locations to make our energy networks smarter. These initiatives include the large-scale roll-out of smart meters and the implementation of ICT applications and sensors to manage the flexible flow of energy. Smart networks support a more efficient use of capacity and infrastructure, and are also more reliable. By expanding our smart energy networks, we are laying the groundwork for the digital services of the future. Stakeholders want Alliander to be open about its intentions, operations, decision-making and dilemmas. Our ambition is to gain and retain a leading position in the Transparency Benchmark and to apply GRI-G4. We are conducting an active dialogue with a broad group of stakeholders and organising a stakeholder panel. Alliander is a stakeholder-driven company that discusses plans with stakeholders to obtain their feedback. In the past year, Alliander was ranked 9th on the Transparency Benchmark of the Ministry of Economic Affairs. This year too, an external stakeholder panel provided extensive input for our annual report, which adheres to the latest GRI-G4 guidelines. In 2015, we continued developing our corporate websites. Online dialogues were conducted on various material themes, such as the energy transition. We apply the principles of the Dutch Corporate Governance Code wherever applicable. Local energy storage is a potential stepping stone towards a sustainable energy system. This entails storing a surplus of renewable energy as a buffer for periods when demand is high. Customers want to make their own energy choices and may have various reasons for storing energy, such as to save on costs or share energy locally at peak times. Alliander is exploring and investigating the added value of energy storage. By forging partnerships and launching experimental projects, we are better able to assess the impact of energy storage on our work and grids, and to measure the added value for customers. Apart from the technological aspects, we are focusing specifically on the added value of energy storage for customers, as they will largely determine the speed of adoption. In Heerhugowaard, for instance, we worked with customers on researching and testing the flexible use of energy. With an annual procurement volume of about € 800 million, we are a major purchaser of products and services in the Netherlands. Stakeholders expect us, together with our suppliers, to ensure that our procurement is as sustainable as possible. If we can persuade our suppliers to take sustainability as seriously as we do, we can generate a significant positive impact via our chain. We actively seek to improve our supply chain sustainability. This includes making plans with our suppliers to address such issues as reducing CO2 emissions and promoting responsible operations. At least 65% of our procurement volume is socially responsible. In addition, all suppliers must meet the Alliander Code of Conduct. Apart from continuously calling attention to our code of conduct, which is compulsory for all suppliers, we purchased 66% of our procurement volume on the basis of Socially Responsible Procurement (SRP) statements in 2015. These SRP statements support the fulfilment of our socially responsible procurement objective in the Netherlands and enable us to further promote sustainability at our suppliers. In addition, in order to make the supply chain more transparent in terms of sustainability, Alliander has opted for the FIRA platform, which gives us more insight into the sustainability results of suppliers. Customers count on an excellent service, communication and response in the event of interruptions, questions and complaints. Municipalities and business customers not only expect a clear point of contact, but that we deliver on our commitments. Our consumer and business customer satisfaction ratings remain higher than the national benchmark of Dutch grid operators. We work every day to secure a continuous energy supply, both now and in preparation for the future. The quality of our services and communications with business customers and municipalities has increased. And our digital services continued to improve thanks to our 24/7 online accessibility and short response times, as well as the further enhancement of our website experience for consumers and business customers. Our performance was slightly above the benchmark for consumers, and slightly below the benchmark for business customers. Customers expect us to provide a safe infrastructure and that we can also guarantee their safety when we carry out our work. Everyone safely home! That is Alliander’s safety ambition, which applies both to our own people, and to the quality and reliability of our installations. We therefore continuously invest in the reliability of our infrastructure. We are focusing on the top risk-reducing projects, of which we have specifically identified 25. In 2015, Alliander invested about €700 million in the reinforcement, digitisation and maintenance of our networks. We completed 100% of our most important projects. Furthermore, our staff received disaster and incident response training in order to be well-prepared for unforeseen events that impact our infrastructure. Stakeholders expect a clear picture of the value Alliander achieves as well as stable financial results. Sustainable value creation is increasingly important in this context. Our financial policy is primarily aimed at maintaining a solid A rating profile. This enables us to implement our strategy and play a facilitating role in the energy transition. In 2015, we created sustainable value for our stakeholders and retained our solid A rating. In the interests of our providers of (loan) capital, we seek to strike the right balance between achieving an adequate shareholder return and protecting bond holders and other providers of debt capital, while preserving the flexibility to invest and grow. Stakeholders expect a clear picture of the value Alliander achieves as well as stable financial results. We want to realise value for our stakeholders and contribute to a better society. We have set targets for our ratings, FFO/Net debt ratio and solvency, and we monitor their progress. In 2015, we created sustainable value for our stakeholders. Salary increases under the Collective Labour Agreement, investments in networks and buildings, procurement expenditures, employee volunteering, social sponsorship and dividend for capital providers demonstrate our broad economic and social contribution. For the complete materiality chart, please see Other information. This is an integrated annual report incorporating financial, operational and corporate social responsibility (CSR) information. The financial information in this annual report has been consolidated for Alliander and all subsidiaries. The financial report was prepared in accordance with the International Financial Reporting Standards (IFRS) and the relevant provisions in the Dutch Civil Code. The CSR information has been consolidated for Alliander and its three main subsidiaries (Liander, Endinet and Liandon). The most material aspects for our stakeholders mainly relate to the activities of these companies. The CSR report was prepared in compliance with the guidelines of the Global Reporting Initiative (GRI) and the Electric Utilities Sector Supplement. The Alliander Annual Report 2015 was drawn up in accordance with the 'comprehensive' option of the GRI G4 reporting guidelines. Our stakeholders attach great value to transparency - and so do we. Our ambition is to be among the leaders in the Transparency Benchmark of the Ministry of Economic Affairs, and to retain the GRI G4 level. This year, a stakeholder panel gave us feedback during the writing of the report. This marks a new step in our ambition to continue working on the further development of our structural stakeholder dialogue in the coming years. The stakeholders recognised Alliander's facilitating role in the energy transition, but were keen to see more specific information on the longer-term objectives and approach. Their findings can be read in Other information. We adhere to the Transparency Guideline and the relevant provisions from the Dutch Corporate Governance Code and the Decree on Corporate Governance 2009. In recent years, growing attention has been devoted to impact quantification. Impact comprises all the effects that an organisation's activities have on society. In 2015, Alliander initiated a process to take impact measurement a step further. Impact measurement at Alliander is aimed at optimising its social performance through the active management of measurable effects of its activities on a reliable, affordable and renewable energy supply. 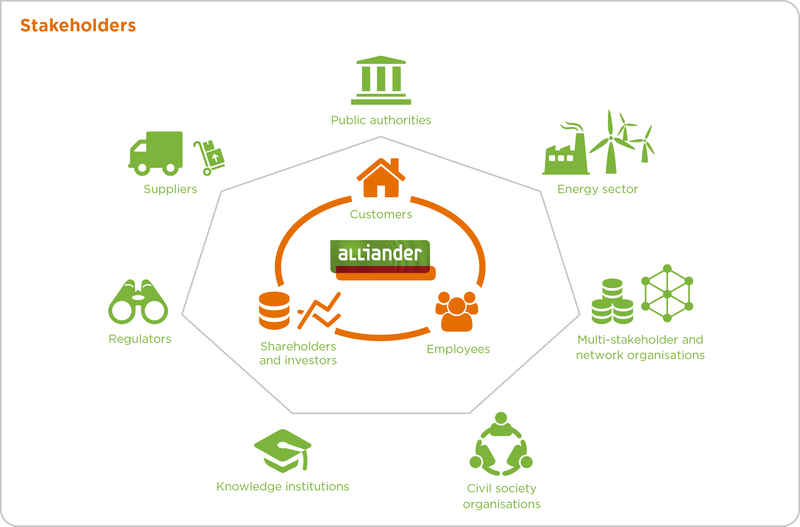 Alliander's impacts on its stakeholders are identified for this purpose. Our impact measurements and reporting will be further expanded in the coming years. In 2015, we measured the impacts of three measures. First, the installation of smart meters at customers in order to achieve energy savings and optimise energy usage. The new remotely readable digital meter will contribute towards securing a reliable and affordable energy network. Second, the operation of a heating network in the town of Nijmegen by Alliander Duurzame Gebiedsontwikkeling (DGO) as a sustainable alternative for a conventional gas network. Third, the implementation of our Step2Work programme, which helps people at a distance to the labour market increase their prospects of finding work. 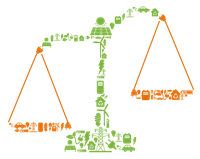 These cases (which you can recognise by the 'scales' symbol) are worked out in greater detail in the stakeholder chapters.